Proper wearing of uniforms (continued). 10-4 be worn buttoned with the three lower buttons on the right side. In foul weather, the coat may be buttoned to the neck. All-weather coat. A black, single, breasted, beltless, water-repellant coat. Its made from 65% polyester and 35% cotton poplin fabric. The coat has epaulets, tabs on the cuffs, and a zip-out lining. Womens coats button to the left and mens coats button to the right. When worn, button all the buttons except the collar button (in bad weather, the collar button may be buttoned). When wearing the all-weather coat, a clear plastic, combination cap rain cover may be worn. Blue working jacket. The blue working jacket is made of navy blue material. It is fully lined with a zipper front. Two military organization patches may be worn on the jacket on an optional basis, subject to the following restrictions: Student Notes: Figure 10-3.Rolling the neckerchief. 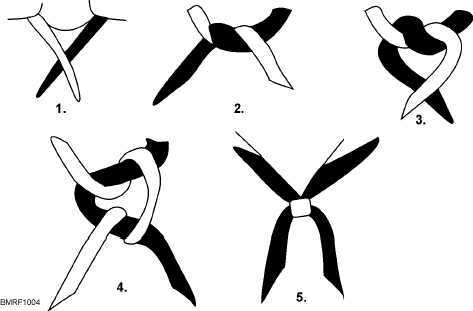 Figure 10-4.Tying the neckerchief.